Your choice in barbecue island design configuration is just as important as the professional grill & components you choose to install. Your outdoor kitchen configuration needs to be thought about in a few important ways. Will you be hosting guests? What type of grilling & cooking will you be doing? Will you require storage or cold storage (outdoor refrigerator)? We’ll be taking you through a few design concepts today. One of the configurations we’ll be talking about today is a spinoff of the traditional linear barbecue island design. This design includes an additional circular or rounded island end. It’s a linear island design configuration, but with the rounded extension. It’s a unique addition that will eliminate the traditional boxy look of a barbecue island design. This minor addition can make a huge aesthetic difference in the finished product. It’s almost purely aesthetic though. You’re only adding a few additional inches onto the counter-top. If you have room for it, you can extend a traditional linear style outdoor kitchen design to include a round table counter-top. This increases the number of guest that can comfortably dine around your outdoor kitchen area. We’ve included a few sample images to help you understand the outdoor kitchen design concepts we’re referring to. 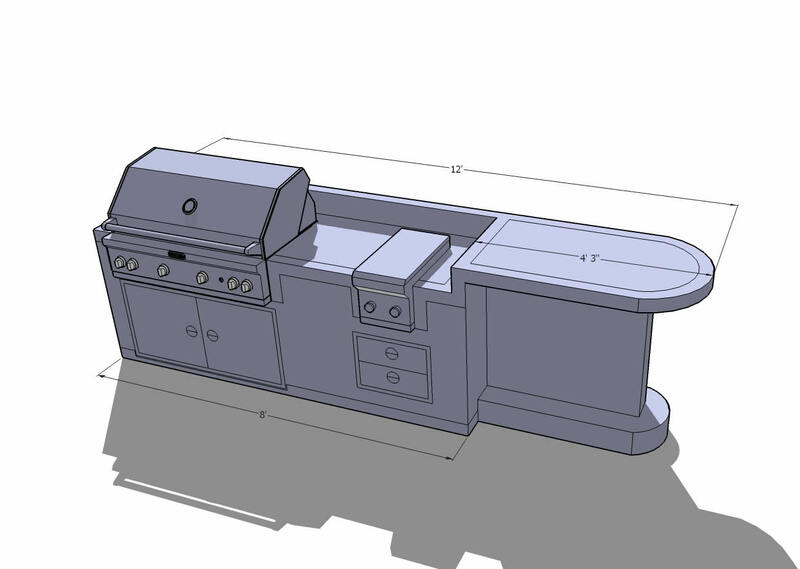 The two design photos we’ve shown thus far have been for traditional height barbecue islands, which is 36” tall. 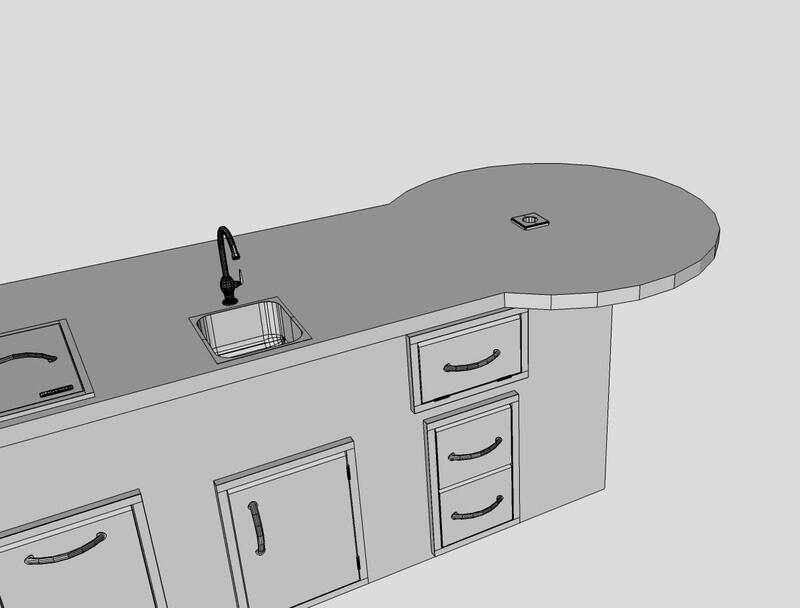 Sometimes, we’ll even design a linear island that will include a bar height counter-top transition. This type of outdoor kitchen design includes a raised level, a level that usually is 42” tall. A raised bar-top that’s implemented correctly can truly give your custom outdoor kitchen an aesthetic flair that is unique and beautiful. 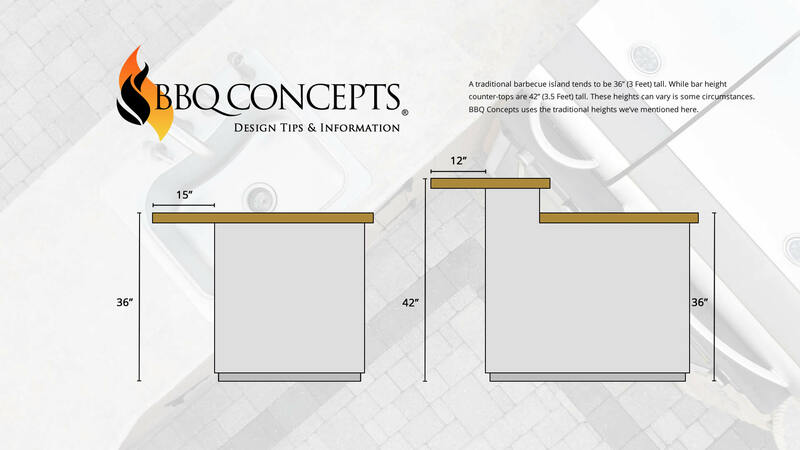 Below we’ve included a nifty little info-graphic that will help you visualize and understand the difference between standard counter-top height and bar height. This will help you get a better idea of what you want and how to describe it to your BBQ Concepts outdoor kitchen designer. When it comes to custom outdoor kitchen design, the options are literally limitless. In all actuality, our outdoor kitchen design team can do just about anything you want. The primary objective of the BBQ Concepts website is to introduce you to some of the existing configurations that are already being implemented within the industry. The first step in building the outdoor kitchen you’ve always wanted is first finding out what you prefer. Have you been looking for a custom barbecue island design company in Las Vegas, Nevada? Well, you’ve come to the right place. BBQ Concepts is the newest outdoor kitchen design & manufacturing company in town. Our professionals have come together from other leading companies here in town. We’re committed to finally doing it right. Here at BBQ Concepts, the customer comes first. You’ll quickly start to see just how different our company is compared to the competition.